Question: What is the maximum mass that may be carried on a single axle with dual tyres other that an omnibus? Question: What is the maximum speed limit in the built -up area unless otherwise indicated, for a vehicle that weighs more than 4.5 tonnes? Question: What is the maximum permissible height of a vehicle and its load, other that a livestock trailer? Question: A heavy vehicle of which the mass, together with any attached trailer and the total load carried (if any), exceeds 12 tonnes is compelled to carry certain emergency equipment, if outside a built up area. What is this equipment? Answer: 3 portable warning signs complying with the relevant Australian Standards. Question: What is the permissible width, including the load, of any vehicle? Question: What are the requirements in regard to any extra mass or oversize permit which may be issued? Answer: The permit must be carried in the vehicle and be produced on demand when requested by any police officer or other authorised person. Question: When must a trailer be equipped with break away brakes? 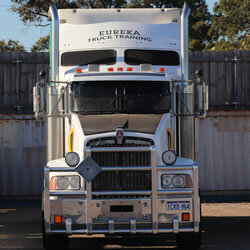 Answer: Where the gross mass exceeds two tonnes or it is a semi-trailer or pole type trailer. Question: What is the maximum speed limit for a vehicle, the gross vehicle mass of which taking into account any trailer attached and including the total load carried, is more than 12 tonnes? 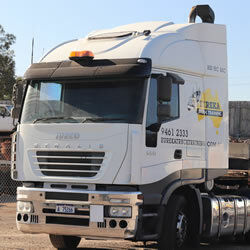 Question: Is it permissible to tow a trailer behind an articulated vehicle? Answer: Not without the written permission of the Commissioner of Main Roads. Question: What are the provisions with regard to condition of mudguards? Answer: They shall be in good condition, free from cracks and sharp or jagged edges. 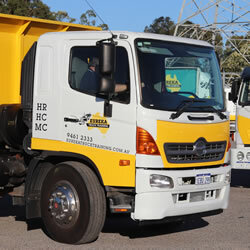 Question: What is the maximum permitted length of an articulated vehicle and its load? Question: What is the permissible overall length, including the load, of any rigid vehicle, other than an omnibus? Question: What is the maximum mass that may be carried on a single axle with single tyres, other than an omnibus? Question: What must you do when you desire to carry an overwidth, overheight, or overlength load or a load exceeding that for which the vehicle is licensed? Answer: Obtain a permit from the Commissioner of Main Roads, or appointed agent. Question: If you are hauling a load greater than your licence permits, what may you be compelled to do in relation to the overload, either where you are stopped or at a specific place? Answer: Off load the excess. Question: Regarding vehicle weight, what information is printed on the registration sticker for a vehicle licensed as a goods vehicle? Answer: Gross Vehicle Mass (GVM), Gross Combination Mass (GCM) and Manufacturers Gross Combination Mass (Man-GCM). Answer: One sign must be placed beside the vehicle, and one each to the front and rear at a distance of not less than fifty metres or more than one hundred and fifty metres. Wherever practicable, at least one sign must be visible to an approaching driver at a distance of not less than two hundred metres.